Kitty looked at the pile of suitcases on her bed and smiled in relief. It was time to return home. At last. It had been a pleasant stay at the resort. She had enjoyed her usual week, plus an extra two days when, during a massage session, her elbow had become too loose and almost came out of its socket. But now everything seemed to be in place again. Suffering from rheumatism, even only a mild case, was not easy. Kitty knew she was blessed to be as strong as she was and to have the money for proper care. “No complaints, doctor,” she replied. “And everything else is as it should be?” he asked. Dr. Allen was the family doctor. He had cared for Kitty ever since she was a little girl, for her mother when she became ill. And now, he tended to her father as well ever since a terrible bout of pneumonia left him with a painful cough. Dr. Allen would have appreciated his three-week long holiday, but would no doubt be home several days before her coach arrived, and her room would be perfectly prepared for her as if she had never left. As soon as her coach was announced, Kitty made her way to the entrance. They always offered her a wheelchair, although she had not needed to use one for years. It was as though nobody believed she was able to get better rather than worse. “Oh, we’ll miss you, sweetie,” the head nurse said, adjusting Kitty’s bonnet. “Unless you require further treatment,” the nurse remarked. “I hope so too, my dear,” the nurse replied. Kitty made her way to the coach, where her last case was being firmly tied to the roof of the vehicle ready for the long journey home. Inside the coach sat a maid and Kitty’s travel bags by her feet. She was ready to attend to anything the Kitty needed on her trip home. As the coach pulled away and rolled down the hill towards the docks where the ferry would be no doubt just arriving, Kitty looked out of the rear window. It was always a little sad to see the resort disappear into the distance. But she also knew that she would be back before long. Her father would not allow her to go more than a few months without treatment. She huffed a breath of indignation. She did not need it. As a young girl, she had needed vast amounts of medical care. Nobody had dared think that a child her age could be suffering rheumatism, and it only dawned on them when she was six that she had been suffering from it her entire life. At six, she was barely able to walk, and always in intense pain at her knees, ankles and back. So much so that she rarely left her bed. She was restricted to a wheelchair until she was ten. But even as she grew stronger and healthier, her father seemed to refuse to acknowledge it. It was getting to a point where she was receiving treatments she did not need, just to comfort him. She lived an active life and enjoyed long walks around their property. She wasn’t a little girl anymore. Her mother’s death had really affected Kitty’s father. He was always protective of Kitty, but when her mother passed away he became even more overbearing. From that point onward he went from simply guarding her when she was in pain, to treating her as though she were made of the thinnest crystal. And no matter how effective her treatments were, no matter how well she felt, he insisted on steam baths, massages, special oils and ointments—anything that was recommended. Although she was tired of this, she did not complain. She smiled, accepted her treatment, and told him how much better she felt after them. She couldn’t hurt him. She had been only eight when her mother had passed, and it left a deep scar on her heart. He may be overbearing, but Kitty would do anything to make her father happy. And it made him happy to treat her rheumatism. It gave him a purpose in life. It was a peculiar situation, where he could not bear to see her in pain, but he couldn’t believe that she was ever not in pain. He needed her to be in pain so he could treat her, so he could look after her. And she needed to play along just so she could see him smile. And yet now she was growing weary of it. She wanted freedom. She wanted to marry. She wanted to go out and watch the races, go to balls, walk with her friends and do all the things that normal young ladies did. As the sun set on the first day, she could already feel her knees trying to seize up, and began lightly exercising them as she sat there, so they would not get stiff as she slept. She would have to sleep on the ferry at first, and the cabins were small and cramped. It was best to go in as relaxed as possible. The journey was long, and it always made her joints stiff. But she knew that once she was home she would limber up in no time. Her condition was nowhere near as debilitating as her father seemed to believe. She could not sit too still for very long, and she could not travel far. But the only reason she ever had to do either of these things was to receive treatment. If she simply stayed home she would not have to worry about such matters. But her father would never understand that. As the sun dawned on the sixth day, Kitty was pleased to wake up and see the fields outside their village. Home at last. Due to the lack of inns on the last stretch of their journey she had been forced to sleep two nights in the coach, and she looked forward to her own cosy bed. She saw the usual bright barn that meant there was only an hour left to go. “Please pack up my books,” she said to the maid. As the maid packed away Kitty’s books and assorted travel items, Kitty looked out of the window and tried to spot the usual landmarks as they rolled by, counting down the minutes until she was home. It was barely seven in the morning as they finally pulled up outside her home. The gardens were in full bloom, and the mansion was glimmering with dew in the sunlight. It shone like something out of fairy land. An enormous, bearded, gruff man walked out, still in his bed coat, a broad grin stretching his plump, furry cheeks. Kitty waved at him through the window as the coach pulled up at the bottom of the stairs. The driver descended from his seat and opened the door for Kitty. She made sure both her legs were feeling strong before standing up and stepping out of the coach. The last thing she wanted was to fall over and scare her father. Once firmly on solid ground, Kitty all but threw herself into her father’s arms. “I have missed you so much, daddy,” she said, feeling her heart rest easy now she was safely home. “I have missed you too, my dearest. Now, come indoors, it is cold. We must get you a nice, filling breakfast,” he insisted. He was just as obsessed with making sure she ate enough as he was with her treatments. Although she did not need much nourishment due to her fairly inactive lifestyle, he would become so worried when she didn’t finish the enormous plates she was served, that now she had taken to dropping some under the table for the dogs. “How is my little girl after her journey? Not too sore?” he asked as they sat at the table, an enormous plate of cold pie, cheeses, and bread in front of both of them. Baron Langley had a glass of wine, and Kitty had her usual spiced tea, an Eastern remedy for her pains, according to Dr. Allen. “I am feeling quite well,” she said with a smile. “You seemed stiff when you walked in,” her father replied sternly. She knew she couldn’t get away with lying, but she still tried. She didn’t want to cause him undue concern. He was very good at worrying excessively all on his own. “I hope so, because I would like to attend a gala on Sunday. Your friends will be there,” he said, taking a hearty bite of cheese. Kitty politely listened and, as he was distracted, dropped some pie to her feet, where the dogs, silent as though understanding their complicity, quickly made it disappear. “That would be lovely, father,” she replied. “I do hope so,” Kitty replied. Kitty just smiled. She knew what would happen. It was what always happened. She would hit off wonderfully with a young man who was handsome, funny, educated, wealthy, and witty, he would go to her father to ask to court her… and then her father would say something about her illness and they would never see the young man ever again. She had stopped caring about this, to be honest. She used to aspire to marry well, have a beautiful wedding, and bear many children. But as man after man had been scared away, she had given up. At least, contrary to her father’s fears, she knew she would be able to care for herself when she was all alone. Kitty dropped some cheese under the table as she ate some bread. She could feel the dogs’ tails wagging against her shins as they enjoyed their breakfast. “I think the gala is a wonderful idea,” she said again with a nod. “It is not for a few days, I shall be fine,” Kitty reassured him, gently resting her hand on his arm. Sitting by her window, Kitty felt very much a prisoner in her own home. This was something else that always happened. Whenever there was even a hint that she was under the weather, she was stuck at home. Her father could not fathom that she might be unwell one day and better the next. In his mind, every little ache required a week of convalescence. The sun shone beautifully outside, the garden looked so bright and fragrant, and she would have to just watch from her stuffy bedroom. She heard a knock at her door. “Who is it?” she asked. “Just me,” her father said from the other side. The door opened and he walked in, smiling proudly as he saw her resting by the window. “I know that you do not like resting here too much. So that you do not suffer the lack of company, I have invited a friendly young man for dinner,” he said, sitting down in the armchair opposite her. Kitty smiled. “I shall choose one with long sleeves,” she replied. “Good girl,” her father said. “I shall ensure that dinner is excellent for tonight.” And with that he left the room. Kitty was just happy to be able to while away the hours trying on dresses, now that she had an excuse. It was something to do. She eventually selected her best dress, a pretty pink number that highlighted her chestnut locks and bright blue eyes. After finding the right shoes and jewellery to go with it, she laid them out carefully on her bed, then returning to her seat by the window. Staring out at the bright green fields, the wispy clouds dancing in the blue sky, and the little birds swooping past her window, she wondered what this young man would be like. However much he seemed intent on scaring them away, her father has excellent taste when it came to her suitors. Dinner time arrived and, dressed and made up, Kitty felt like she was royalty. She smiled at her own reflection as she walked past the mirror and out of her bedroom. Ordinarily her father wouldn’t even let her leave the room when she was “recovering”. This was a wonderful exception. “You look like a little doll,” her father said with a proud smile. Sure enough, just as they made their way downstairs, a young man was shown in by the butler. He was very tall, with dark wavy hair, bright eyes, and a sharp, handsome face. He smiled warmly as a maid took his coat and hat to be hung up somewhere. She had not expected that. A Duke. And at his young age too! Duke Josiah Morton was almost the ideal. Handsome, young, wealthy, and powerful. Provided he was also a charmer to talk to, she would have no trouble getting along with him. “Charmed to make your acquaintance,” Kitty said, making eye contact with him. “I may,” he replied. “You really are lovely, I am astounded that you do not yet have any suitors,” Duke Morton said, grinning at her. “What a coincidence, I am away a lot also. I suppose we could try and travel together,” he replied. “I am not sure that you would want to accompany me on my travels,” Kitty said with a nervous giggle. “And why would that be?” Duke Morton asked, sipping his wine. Kitty could feel her face hot with shame. Ought she to hide this from him? It would not be right, surely? And yet she knew what happened whenever she mentioned her condition. Or better said, whenever her father mentioned her condition. It was probably better to get it out of the way. As quickly and as casually as possible. If he was going to ignore her, then so be it. But there was no point letting him build up hope and interest only for him to back away as soon as he found out. Besides, it wasn’t as though her condition would scare away everyone. She was not so ill. Someone would eventually look past it and understand her. But before she could say anything a maid marched in and curtsied low before her. “We have a letter for you, mistress,” the maid said, holding out a tray with a letter on it. Kitty left the room. She couldn’t read this in front of her new suitor. She knew where it was from based on the seal. The resort. She opened the letter and read it. Just a confirmation that her treatment would not be for another six months, unless rescheduled, as she was doing very well. Kitty sighed in relief. “Maid?” she asked softly, so as to not be heard on the other side of the door. Kitty was happy. She knew her father would no doubt reschedule, but it was always good to hear that her health was robust. Even if her father wouldn’t believe it. Rejoining her father and the duke, she curtsied before sitting down. “I see, was it from the resort?” her father asked. “Oh, it is nothing, just my treatment has been rescheduled,” she replied without thinking. “And you cannot say what that ailment is?” he asked. “I am not sure I could marry a young lady who is going through treatment for something,” the duke said, an eyebrow rising again in suspicion. “I am not sure it is worth my staying for dinner,” he replied. “Now, now, let’s not be too hasty,” Baron Langley said, slight panic creeping in his voice. “I am sorry to have troubled you, Your Grace” Kitty’s father said, settling back into his seat as the duke left. He looked down at his plate. Kitty could tell her father had lost his appetite. This was a bad sign. This was always a bad sign. When he was comfortable and happy, he was always hungry. When he did not eat, something was wrong. He kept staring at his plate until they heard the front door close. Duke Morton, like many before him, had been scared away. She knew this hurt her father and she shouldn’t have said it. But she was not about to sit there and be blamed for her own lack of suitors. Her father’s face grew red with rage. “Perhaps at the gala I shall meet a man who does not mind, but so far they have all been resistant to courting me for that very reason,” she added. “No, young lady, you shall not attend the gala. You may come along and wait in the front room as everyone else enjoys themselves,” he replied. Kitty felt her heart sinking as she realized what she had just done to herself. The gala would have been wonderful if she had been allowed to attend. She watched from the front room of the Duke of York’s mansion as the guests paraded up the stairs, each more elegantly dressed than the last, laughing, smiling, and ready for a long night of drinking, socializing, and dancing. Kitty could hear the cheer outside the door to the front room, wondering if she got closer to the door whether she would be able to make out the conversations taking place. But then she would not be able to see them marching in. Everything looked so luxurious, so exciting, so beautiful. She should be out there, or, better yet, already in the ball room, wearing her sapphire blue dress, spinning and dancing until she was giddy with joy. Instead, dressed fairly plainly, Kitty sat holding a book in the front room, trying to eavesdrop on the guests as they arrived. She would not be able to listen in once everyone was there. The dancing was taking place at the other side of the vast mansion, and she could barely hear the music. But people had been arriving for the past hour, and already the crowd was thinning and slowing. Soon everyone would be dancing in the ball room and she would just have to sit in the front room and read a book, like a child waiting to be sent to bed. As the last coach pulled away and the last beautiful dress waved in the breeze and disappeared through the front door, Kitty curled up tighter in her window seat and finally opened her book. Before she could even begin reading, the door opened with a slam, startling her. A young woman walked in, sighing in exhaustion. She turned to the left and arranged her hair in the mirror, before inspecting her face, her jewels, and the fit of her dress. She was oblivious to the fact that she was not alone, so Kitty picked her book back up and began reading it quietly, as though she also had not noticed the other woman. Nevertheless, she watched over the edge of her book as this beautiful young woman, with a crowded arrangement of silky, shiny, thick black hair, mellow blue eyes, and a sensual gait, preened herself in front of the mirror. As Kitty turned the page, an abandoned book mark slid out and landed on the floor with a whisper. It was loud enough. The lady turned around and scanned the room. Then her eyes landed on Kitty. “I beg your pardon, I did not see you there,” she said with a nervous chuckle. Kitty shook her head. “It is quite alright, I was absorbed in my book. I am Kitty Langley,” she said. “I am Delilah, Delilah Sinclair,” the woman replied. Sinclair… Kitty knew that name from somewhere, though she couldn’t quite put her finger on it. It was something important, and yet as soon as she felt she was about to recall it, it slipped her mind. Delilah had returned to her reflection and was aligning her necklace so that the clasp was once again behind her neck. “Why are you not dancing? At first, I thought you were a member of staff, you are dressed so plainly, but your clothes look far too expensive,” Delilah observed, walking over to the fire place, sitting down before it, and slipping her feet out of her slippers. “Not at all. I was going to be there, but I had an argument with my father, and it is my punishment to not attend the gala,” Kitty replied. “That must have been a serious matter,” Delilah said, finally leaning back in her chair, looking into the fire. “So you are not seriously ailing, or dying?” Delilah asked a little flippantly. “And your mother?” Delilah asked. “She passed away when I was a little girl. I think my father is more protective because of it,” Kitty explained. “It used to hurt, and my joints used to be stiff all the time. But lately I only have the odd bad day. Most of the time I am no less capable than any other girl my age. And now I must pretend to still be ill, and go along with my father’s beliefs, which is ruining my marriage prospects. If I were to act as well as I feel, my father would be saddened by the fact that he does not need to care for me.” Kitty sighed and sank back further into the window seat. It was odd to talk to a stranger about this, but she felt better for talking to this wonderful young lady. She noticed that although there was a ring mark on her finger, there was no ring. Delilah pursed her lips. “I am not.” Then, she fell silent. Kitty paused, waiting for Delilah to add something else. Especially considering the little white line left behind from wearing a wedding ring many years. But she said nothing. “Alas, it seems that they are,” Kitty replied. “And why would you want to settle for the sort of man who runs for the hills when he faces even the smallest challenge? If you ask me, your circumstances are a blessing, as they will drive away all but the most serious of suitors,” Delilah mused. “And what if nobody is serious?” Kitty asked. “Then would you not rather be a spinster, than married to a coward? I know I would,” Delilah replied with a smirk. Kitty smiled. Delilah was such a wonderful person. How could she be so warm, so kind, so encouraging to someone she had only just met? Although they had barely been talking half an hour, Kitty felt a strong affinity for Delilah, as though she were discovering a sister she had never had. “Thank you for being so kind to me,” Kitty said softly. “Not at all, I am just telling you the truth. Sometimes we cannot see the truth due to how our emotions get in the way of our senses, hiding things that are in plain sight. So, like a blind person, we need to have the truth described to us, so that we will recognize it,” Delilah explained. “So you truly believe one day my prince will come?” Kitty replied with a laugh. “I do, I honestly do,” Delilah said. “I just wish he would hurry up. Or I shall be a hundred on my wedding day,” Kitty replied. “I also hope we shall meet again soon,” Kitty replied, watching as Delilah slipped her perfect little feet into her slippers and all but floated out the door. She was so in awe of Delilah’s grace and beauty that she did not pick up her book again until the door had clicked softly shut. Several weeks passed and slowly Kitty’s father forgot about her disobedience and she enjoyed some of the few freedoms that he did not consider “too much” for her. She was now able to go out into the garden, free run of the house including the dogs’ room, and, most importantly, to entertain guests a couple of times per week. Although her heart still yearned for more, for now she was just glad not to be stuck in her room with nothing to do but read. She loved her books, but even at the resort she enjoyed more variety than one room and a shelf of books day after day. Her friend, Duke Haskett, had come to visit her shortly after the gala, and his wife, Mary, had promised to spend more time visiting Kitty. She was a wonderful woman, and kept true to her word, regularly stopping by with flowers, books, sweets, and little trinkets, to brighten up Kitty’s day. Dr. Allen was not exactly company, but it was nice to have him around. He rarely had much work to do with Kitty, as most days she needed no care at all, but he would make sure he was seen to administer oils for her joints, and to prepare her special herbal teas, to let Baron Langley see that Kitty was looked after. Whereas many young women did not have a relationship with their father as they grew older, instead bonding with their mother, Kitty had grown very close to her father. And not having any male heirs to pass the title onto, Baron Langley was pleased to teach Kitty all about his responsibilities and rights. She would listen to him intently, imagining herself in the future as a spinster, Baroness Kitty Langley, fulfilling the same position. So she was not short of good company. But the person who Kitty longed the most to see had not yet made an appearance. Helena Keats, her childhood playmate, was still very ill. They had met through Dr. Allen, before he became their private family doctor. Back then he was a consultant for five families in the area, and one day, when visiting his office, Baroness Langley had bumped into Lady Keats. Although Lady Keats was several ranks below Baroness Langley, the two of them found they had much in common and soon became the best of friends. Which meant that Kitty and Helena would play together a lot as children. Both being sickly, they never left the playroom, and barely did anything, but they enjoyed it. It was nice to be able to play with another child that had their own energy and movement restrictions. With time, Kitty had learned that Helena could not move her legs effectively or breathe very well because at the age of two a cart had run into her, crushing the lower portion of her back and ribs. She had regained some mobility, but would never walk normally again. They found solace in one another, but whereas Kitty grew stronger and stronger as she received increasingly effective treatments, Helena only got worse and worse. It reached a point where Helena became bedridden, and besides the odd walk in a wheelchair, she barely left her house any more. Nevertheless, they had remained friends. Although not as close as they were before, they never forgot one another and remained in contact through letters, visiting each other as much as possible. But Helena had neither stopped by nor written a letter inviting Kitty to visit in all the time since she had returned. And now Kitty was worrying. One night she woke up with a sense of dread. As though something absolutely terrible had just happened. She sat bolt upright, unable to get back to sleep at all. Something was very, very wrong. As soon as she heard him walking down the hallway, she threw on her bed coat and went to find her father. “Not a bit, I’m afraid. I suppose they are busy. Or in London again,” he replied. “Or perhaps their letters have been lost in the post,” Kitty replied. Her father’s study was a big, brown room with not much light and not much room to move around in. It was so full of different files, books, and stationary items, Kitty sometimes wondered if he had just bought an entire book store. Settling into the vast leather chair behind the desk, Kitty sat down to pen a letter for Helena. The post would arrive later that morning, so perhaps she would be able to send it with the mail man. I hope that my letter finds you well. It is only that I have returned from my treatment at the resort and I was wondering if you should perhaps like to visit. Or perhaps I should visit you? Please write back to me and let me know how you are! Folding it into the envelope and rushing downstairs, she got to the door just as the post man knocked. At the second knock she swung the door open, startling him and causing him to drop the letters he was holding for them. “I have a letter for you to take with you,” she said. They exchanged letters and as he walked off, Kitty’s heart beat faster. Perhaps this was from Helena? Then she could rest easy, knowing her friend was well. Kitty looked at the letter in her hand. The handwriting was, sadly, not Helena’s. It wasn’t that of anyone she knew, for that matter. The letters were big, looping, and beautiful, in a thick ink which left folded ribbon-like lines behind, like an inscription beneath an artist’s drawing. Kitty put her father’s two letters on the dresser beside the front door and tore her own letter open. Please forgive me, I have asked Duke Haskett for your address as I need your assistance most urgently. My little brother has foolishly injured himself whilst riding down country roads last night. He is in great pain and needs someone to care for him. Unfortunately, he rejects all medical care. No matter what I have said or done, he stubbornly refuses to have a doctor or nurse care for him. It is only after arguing with him the better part of the night that he agreed to a normal person, with some experience handling such conditions, becoming his in-house nurse. The problem now is that I do not know of anyone else who could perform this task. And then I thought of you. You have lived with aches and pains much of your life. Perhaps you would be able to persuade him to care for himself? And to nurse him back to health? I know it is a lot to ask, but my little brother really needs help, and it may be the only way of assisting him. I beg of you, please consider my request. Kitty was so surprised she read and re-read the letter a few times over. She didn’t even hear as her father walked into the hallway. “What have we here? Why are you standing by the front door? There are cracks under the door, you will catch cold,” her father said. “No, she was someone important, I can’t quite put my finger on it… What is she like?” Baron Langley asked. “Red dress, very thick hair and blue eyes?” Baron Langley asked. “She says that her little brother has injured himself and needs someone to help look after him and nurse him back to health, and she is asking me,” Kitty explained. “Do you wish to go?” Baron Langley asked. She could hear pain in his voice. She knew he wanted her to say it was scary and she didn’t want to go. But she couldn’t lie to him. She needed to seize the moment. “I see,” Baron Langley replied. “Do you… do you not want me to go?” Kitty asked. “I do not want you to go. I would rather keep you here, where I can see you and look after you. Nevertheless, I think it would be very good for you to go and help her. It would help improve your standing, and you would also be in the company of people who you consider friends,” he replied. “So I may go?” Kitty asked, astonished. “Of course you may. It is just a friend and her little brother. And your friend is a woman of standing. It is a fantastic idea to move in with them a while, and teach them from your own experiences,” her father explained. Kitty grinned. “Thank you so much, daddy,” she replied. “Besides, that is just the sort of thing which your mother used to do. And her recklessness led to me, and to you. I can put my faith in that,” he said, hugging her. “I doubt I shall find love, but at least I may find fulfilment,” she replied. “As long as my little girl is happy, I do not care,” he said. Kitty was relieved to find out that Delilah Sinclair did not live very far. Although she had always dreamed of setting off on her own adventures, actually going somewhere unfamiliar concerned her. She had only ever experienced her home and the retreat ever since she was a little girl. It was nice to know that even though she was going on an adventure of her own, she would be within a two-day journey from home. And besides, a longer coach ride might have upset her joints. Two days, stopping at an inn on the way, was no trouble at all, and she knew she would be able to move normally as soon as she got out of the coach. As they drove in through the gates, Kitty was taken aback by how well Delilah Sinclair lived. Her father had not been wrong when he assumed she was someone of importance. The estate was quite a bit more than she had expected. The grounds along stretched out so far, and were so full of exotic plants, it felt like she was moving into another country, all owned by Delilah’s family. As the building itself became visible through the final row of silver birch trees, Kitty spied some enormous, spiky plants arranged around a fountain so vast she wondered if it carried a year’s worth of water or five. Stepping outside, Kitty felt tiny in front of the huge white pillars and the looming doors of the house. The driver carried her bags up the stairs and rang the doorbell as she made her way up the steps more slowly, taking in every little feature, every carving and every accent, on the face of this magnificent building. The door opened slowly and a servant guided them both inside. The building was as amazing inside as out. The walls and floor were gleaming marble, and the marble stairs were adorned with a rich red carpet, held down by weighty metal bars so it hugged each individual step. The furnishings were deep mahogany, and items from around the globe clung to every wall, shelf, and table. An elephant’s tusk, a Turkish carpet, a bear skin rug, and a vast brass gong were the biggest items Kitty could see, but around them cluttered countless smaller artefacts. And yet before she could go and look at them, Delilah appeared at the top of the stairs, looking relieved. “I am so glad you could make it!” Delilah said, gliding down the stairs and embracing Kitty warmly. “And where is your brother now?” Kitty asked. “In his room, in bed,” Delilah said. “Can he move at all?” Kitty asked. “So it is his joints?” Kitty asked. They arrived in front of a tall, dark, ornate door, where Delilah stopped and knocked. Nobody inside said anything. She knocked again. Still no reply. Delilah shrugged, swung the door open, and ushered Kitty in, following close behind her. It quickly became apparent to Kitty that although he was younger than Delilah, Augustus Sinclair was not a little boy. In the bed lay a man, of at least thirty years, with thick black hair and a day of stubble, fast asleep between the pillows. The blankets had slid down to his waist, revealing that he was wearing nothing but a light vest on top. A vest which was stretched at the arms and neck, revealing broad shoulders and a muscular, lightly hairy chest. A vest which clung to him so tightly that Kitty could see each outlined abdominal muscle, and even his belly button. His chest rose and fell steadily with each breath. He stirred a little. The blankets slid down further, revealing a steak of flesh between the bottom of his vest and the top of his long johns, his hip bone and taut muscle fully in view. “But, he is a man,” Kitty replied nervously. This also took Kitty aback. “An Earl?” she whispered to herself. Her eyes landed on the beautiful man lying in the bed at the far end of the room. That man was an Earl? He looked so rough, so unkempt, so rugged. She would have taken him for a noble’s mischievous son, perhaps, but not for a man with a title all of his own. “The four of us?” Kitty asked hesitantly. Kitty could feel Delilah’s words pulling at her heart strings. But then she glanced at the sleeping man again. Earl Augustus Sinclair. He was too attractive, too desirable. There would be talk. “Promise me nobody else will ever find out,” Kitty said. As they spoke, Earl Sinclair’s eyes fluttered open and landed on the two women. For a moment he seemed a bit dazed, then he focused on them. Kitty looked into his dark eyes and saw something she had not seen before. A strange combination of pain and desire, as his eyes scanned her figure. He smiled groggily and pushed himself up on the pillows. Then he winced with pain and let out a groan, collapsing back, only sitting up a little straighter than before. Kitty blushed, noticing that the movement had further pulled up his vest, revealing much of his hard, chiselled stomach, shining with a faint layer of perspiration, heaving with his pained breaths. She looked away and tried to fix her eyes on a painting across the room, but they kept being drawn back to that naked flesh. Earl Sinclair just groaned in what seemed like a combination of frustration and pain. He cracked open one eye. “Very well, she may sit with me.” He made no effort to move, or to cover himself. Kitty looked to the bedside, where there was an empty chair. She had just wanted to leave. But something about him stirred something in her. The pain was something she knew, something she understood. And his stubbornness reminded her of her own father. She wanted to help him. She wanted to take away this beautiful man’s pain. Someone who looked so wonderful did not deserve to wear such a pained expression. Striving not to look at his bare stomach and hips, Kitty sat down beside Earl Sinclair’s bed. “How are you feeling today? Your sister said you had an accident last night,” she began. 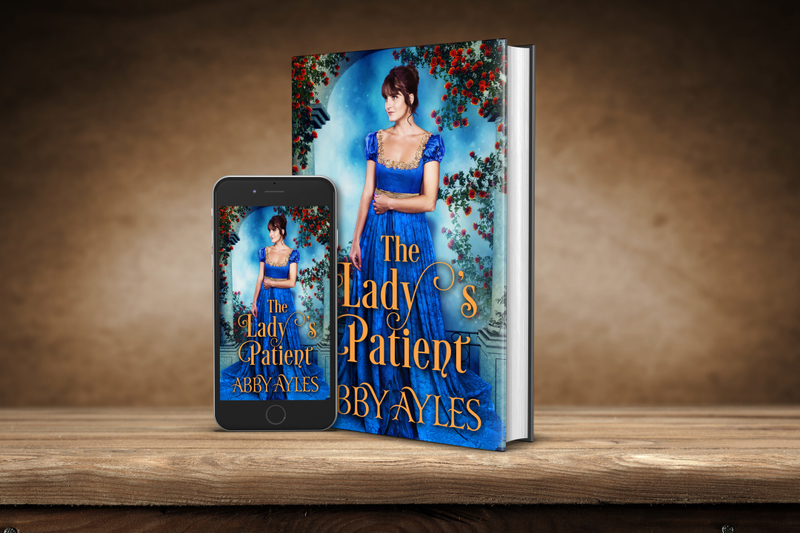 “I am feeling rotten, I am in agony, and those bird-witted doctors must have done something horrible to my back because it feels broken from top to bottom,” he replied, turning his head to face her, making eye contact. “What do you do on a bad day?” he asked. And with that he sank into his pillows, almost immediately falling back asleep. Kitty stood up, trying not to look at his bare stomach again as she walked over to where Delilah was. What a curious man he seemed to be already! In some ways he reminded her of her father. He was gruff and stubborn, and he would only have things his own way. He was commanding her as though he believed he had a right to, and yet she felt compelled to look after him, if only because through all that stubbornness she could spot a hint of fear, of weakness, that he was trying to defend. And yet in some ways he reminded her of her mother, especially after the illness, when she was despairing, had lost all her faith in medicine, and turned to God to either cure her or take her from this Earth. “So, shall you stay, or am I forcing him into hospital?” Delilah asked as they walked out of the room. “I shall stay,” Kitty replied. 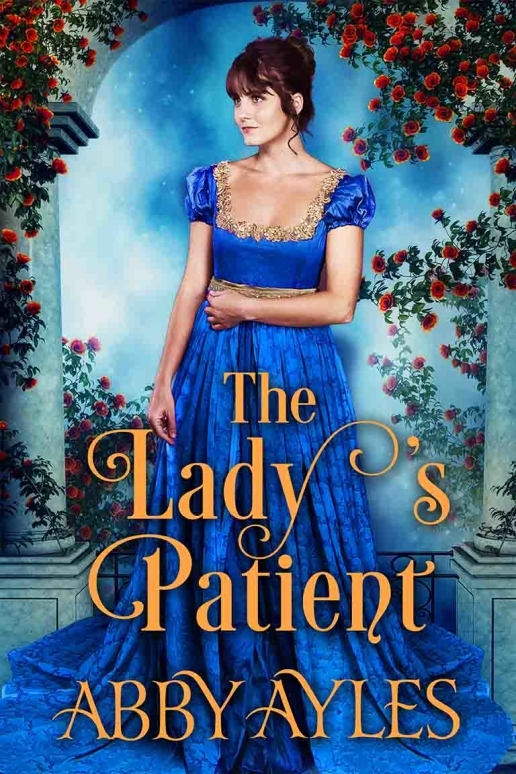 “The Lady’s Patient” is live on Amazon!